Black Bear Gran Fondo | The Black Bear comes out of hibernation! 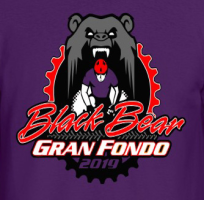 Registration is now open for the Black Bear Gran Fondo 2019 ride! This is the nineteenth year that the Grayling Rotary Club has organized a Black Bear event and we will continue with the gran fondo format we started in 2016 which has been wildly successful!.We are grateful for the many loyal followers we have developed over the years and hope to continue to earn their support and loyalty with our redesigned Black Bear Gran Fondo event and attract new Black Bear enthusiasts who will also return year after year. It’s a race, it’s a ride and it’s a party at the finish line! By definition, it is a mass participation cycling event that got its start in Italy in the early 1900’s. Loosely translated, it means everything from “great foundation”, “great distance” or “great endurance.” Some cyclists ride for the satisfaction and pride of just making it to the finish line. Others want to improve upon their previous times and to challenge themselves, their friends, their teammates. Some ride to win. What is a Gran Fondo Start? Mass start where riders are required to stage according to their speed and ability to ride in a large group. All riders depart the start line at one time, requiring less experienced riders to position themselves toward the back of the mass start group. If any rider is in doubt of their ability to securely hold an even line at high speed with riders in close proximity, it is vital that they line up towards the back of the start line group. All route timing is relative to when the riders cross the line, so no time penalty will be incurred by starting further back in the group. Dedicated volunteers at corners and rest stops with roving SAG Support. Gran Fondo format starting and ending at Hanson Hills Recreation Area. 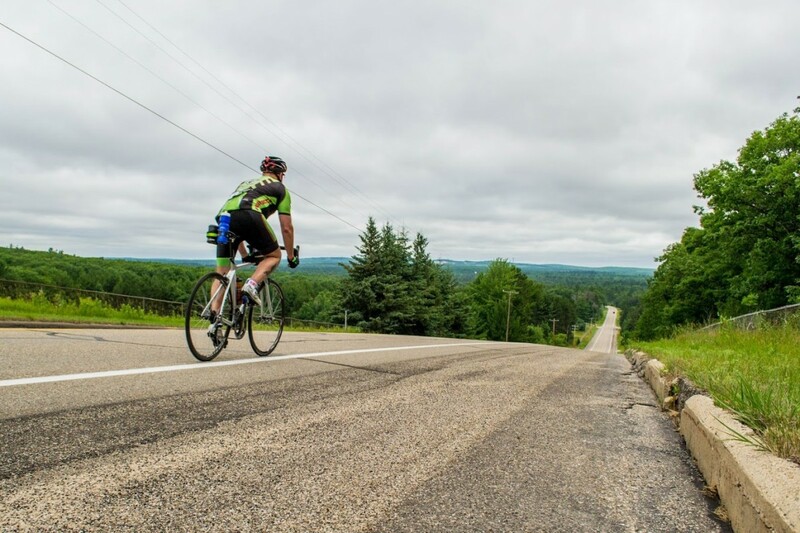 100 mile (century), 62 mile (metric century) and 45 mile chip-timed looped rides on paved roads through the breathtaking setting of rural northern Michigan’s AuSable River Valley. Finish line celebration meal and fun. Three routes to choose from: 100 mile route with two additional concentric routes that fit inside the 100 mile route: 62 miles (metric century) and 45 miles. All routes start and finish at Hanson Hills Recreation Area (HHRA) in Grayling, Michigan, are chip-timed, are on paved roads and experience the beauty of both Crawford and Roscommon counties. 100, 62 mile routes go clockwise and cross the famed AuSable River at various points along the way. Our 45 mile route heads south on Military Road from Hanson Hills and then clockwise around Higgins Lake and back again to HHRA on Military Road. Rest stations providing nutrition and hydration, corner marshalls, and roving SAG support will be there for our riders on all routes. Riders on all routes will travel on both flat and gently rolling hills, past lakes, rivers and forests, with points of interest all along the way. There area also amazing elevations well know to our riders that have completed the challenge on any of the three routes, and you can do it too! More Information About the Race! 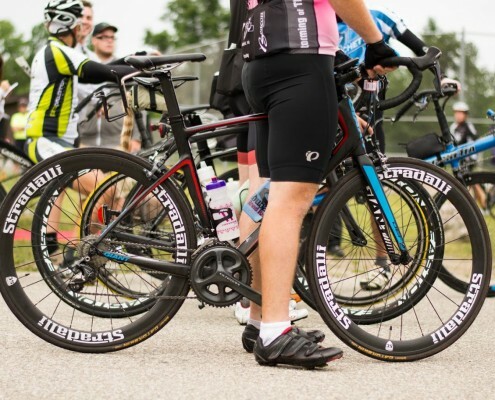 Organizers for the Black Bear Bicycle Tour – a cycling event that drew hundreds of participants per year for 15 years – are making significant changes to the event, including a new name, a new weekend, and a new format. 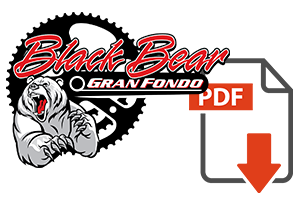 The Black Bear Bicycle Tour’s new name is the Black Bear Gran Fondo. For more of this story, click here! For additional news articles click here and click here.